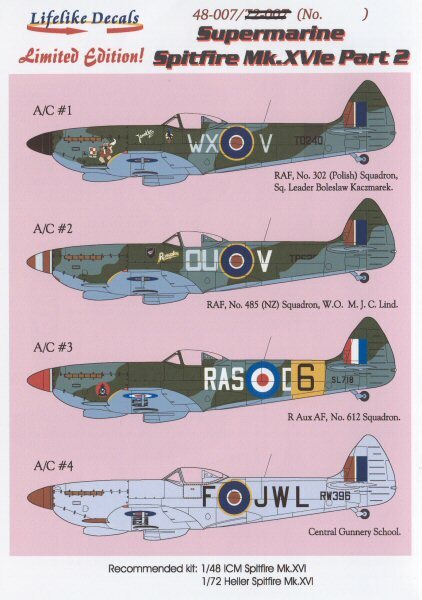 Lifelike Decals from Japan turns out some colorful and nicely printed subjects. 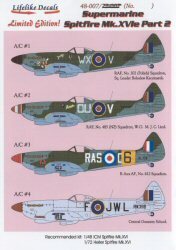 In this set, we have four distinctive Supermarine Spitfire Mk.XVIe examples just in time for the release of the Italeri kit or with the ICM kit. 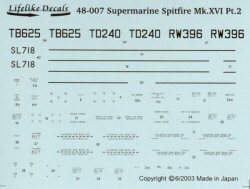 As you can see in the decal image, this set comes complete with a full set of national markings, distinctive unit markings, and a wealth of maintenance stencils. 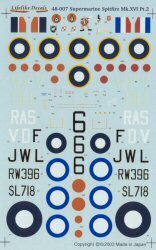 If you're looking for a colorful alternative that isn't from the mainstream Superscale/Eagle Strike/Aeromaster line-up, here is a nice way to be different! You can purchase these decals directly from Lifelike Decals. My sincere thanks to Lifelike Decals for this review sample!